Apparently, the modern actor uses just one device when it comes to creating a persona of menacing, tough guy extreme: the two-octave drop, vocal growl. Christian Bale started it with his gravelly-voiced Batman, and in Predators, Adrian Brody uses a combination of weight-lifting and grunty speech to develop his super-mercenary leader type. 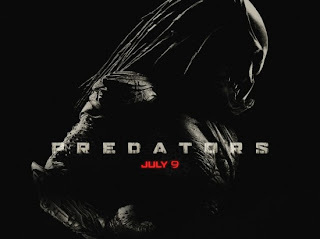 The good news is that Brody drops the act about 2/3 into the film, when his character finally opens up to his fellow "prey," all castaways on the terrible planet of the Predators. The film opens strong with a mid-fall shot of Brody attempting to figure out an alien parachute mechanism. This thrilling bit, which is also remarkably well shot and creative marks one of the high points of actual suspense in the film. When Brody's mercenary meets up with other rogue's gallery members from various parts of the world, and Topher Grace playing a very Eric Foreman-esque doctor, he quickly figures out why they are where they and what they have in common. But he doesn't say. And for most of Predators, the suspense is formed by that very device. Characters will say just enough to let you know that they obviously know what's up, but they don't finish that sentence. Really though, any discerning or vaguely conscious audience member is with them, if not steps ahead. But, Predators seems built this way on purpose, intentionally suspense-less as it plays into all the traditional B-movie action stereotypes. 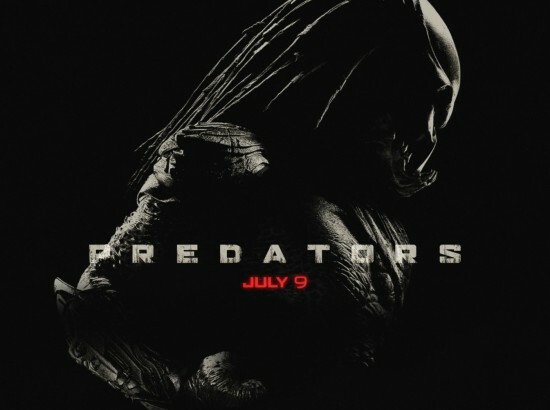 The band of warriors, all "predators" on their home planet of Earth, find themselves on a new, night-less planet run as a game preserve for the Predators race who long ago took out Carl Weathers and Jesse Ventura, but couldn't get Arnold. What happens next is a series of "who's the next to die" moments that boil down precisely how you'd imagine, with the most developed and most unlikely characters making it the longest. All the deaths are brutal, though only two are extremely memorable. Someones skull and spine get torn out, so there's that. And there's an all too short moment with Laurence Fishburne that adds some small laughs and a lot of strange contrivance. The film succeeds, though, because it doesn't try to be anything big, and does everything it does with minimal use of CGI, something that's very appreciated in a time when any and all action movies throw clumsy graphics around. There's a twist too, but it doesn't make a lot of sense when it's never completely set up. It's more of a mystery that had potential to be interesting, but never quite got there, and then ends, joyfully in an explosion. Predators is just a fun action callback to the original film. It doesn't try to break new ground or even define its world. Instead it plops the audience down in the world they kind of already know and gives them what they want, alien warrior violence with no heady-high-concept aftertaste.